The Jefferson is an exquisite rambler home that boasts an expansive floor space. It’s built with 2 bedrooms, 1 bathroom, and a master suite that features a master bath and walk-in closet. It also comes with a roomy dining area and a kitchen that’s connected to a sizable pantry. What’s more, it has a dedicated space for a formal living room so you can invite several people into the home and have the opportunity to throw bigger parties. At Perry Homes Utah, we pride ourselves in providing premium-quality homes at affordable prices. Each of our designs is thoughtfully constructed to suit the needs of every type of household. Plus, our house buying process is seamless, transparent, and stress-free, giving you greater peace of mind when constructing your dream Perry home. Build your dream Utah home by contacting Perry Homes Utah today. Our company has been in the heritage home building business for over 40 years, so we’re experts when it comes to constructing the perfect rambler and two-story homes. We offer a wide range of exterior and interior customization options, which our design center personnel will gladly explain to you in full detail. What’s more, we can assist you in financing your future home to ensure that your home will have everything you need without you having to break the bank. Give us a call at 801-264-8800 and let’s discuss. 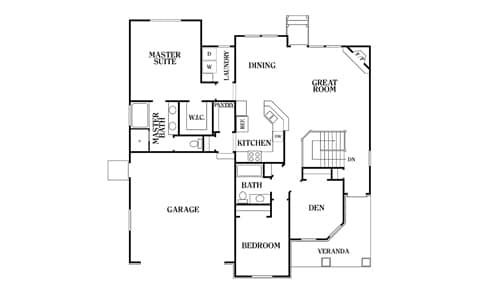 Elevation shown may not be standard and all items shown are subject to change at any time solely at the discretion of Perry Homes and its affiliated companies. Copyright by Perry Homes, Inc. No reproduction or other use of these renderings or plans may be made without the written consent of the copyright holder.